1No other competitor currently has voice remote through their own service/STB. There are mobile apps or 3rd party equipment such as Amazon Fire devices w/Alexa that give voice control. 2Availability of On DEMAND programming is based on the channels included in your Cox video subscription package. Based onTop 100 TV shows per Nielsen National People Meter (NPower, Ratings Analysis) as of March 2018. 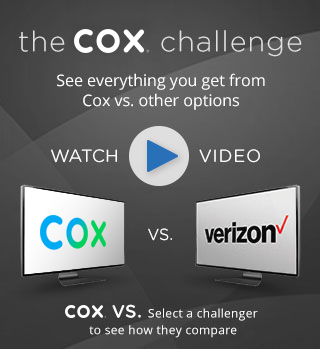 3Availability of On DEMAND programming is based on the channels included in your Cox video subscription package. Subscription to channel required for access to free On Demand programming for that channel. Comparison based on Cox-commissioned third-party research as of currently March 2018. 4Requires Cox Contour TV with Record 6 DVR service and equipment. Storage claim based on 1000 hours of SD programming; capacity varies with mix of SD and HD recordings. 5Cox does not charge extra for HD versions of standard-definition channels included in Contour TV subscriptions. 6Based on analysis by Ookla® of Speedtest Intelligence® data for April to June 2018. Ookla trademarks used under license and reprinted with permission. 7Excludes Gigablast Service. Excludes Wickenburg and Douglas AZ. 8Available to customers with Cox High Speed Internet Preferred and higher plans. See cox.com/WiFi for coverage areas and hotspots. 9Available with Cox Digital Telephone. Access to some Phone Tools functions may require subscription to additional phone features. 10Requires Cox Digital Telephone with voicemail. 11Unlimited long distance calling in the U.S., to Canada, and to landlines in Mexico included at no additional charge with Cox Digital Telephone Premier. Get started with our best bundle offers. for 12 mos. Regular price $194.97/mo. for 12 mos. Regular price $285.93/mo. for 12 mos. Regular price $307.97/mo. for 12 mos. Regular price $188.47/mo. for 12 mos. Regular price $268.44/mo. for 12 mos. Regular price $308.49/mo. Per mo. for 12 mos. Plus, you can save up to 55% when you bundle your services! Offers expire 07/01/19 and are available to new residential customers in Cox service areas. See Cox Digital Telephone service details. See Contour TV service details. See Internet service details. *See 30-Day Money-Back Guarantee terms and conditions. **See On-Time Guarantee or $20 Off Your Next Bill terms and conditions. HBO®, Cinemax® and related channels and service marks are the property of Home Box Office, Inc. HBO GO® is only accessible in the US and certain US territories where a high speed broadband connection is available. Minimum connection of 3 Mbps required for HD viewing on laptop. Select titles not available in HD. Minimum 3G connection is required for viewing on mobile devices. For specific technical requirements for devices, go to hbogo.com/#devices. Some restrictions may apply. © 2019 Home Box Office, Inc. All rights reserved. STARZ and related channels and service marks are the property of Starz Entertainment, LLC. Visit starz.com for airdates/times. SHOWTIME and related marks are trademarks of Showtime Networks Inc., a CBS Company. Call anyone, anytime in the U.S., Canada, Mexico, China, Hong Kong, India, Norway, the European Union (Austria, Belgium, Bulgaria, Croatia, Republic of Cyprus, Czech Republic, Denmark, Estonia, Finland, France, Germany, Greece, Hungary, Ireland, Italy, Latvia, Lithuania, Luxembourg, Malta, Netherlands, Poland, Portugal, Romania, Slovakia, Slovenia, Spain, Sweden, United Kingdom) and U.S. territories (Puerto Rico, U.S. Virgin Islands, North Marianas/Guam, American Samoa). †When you need us, we'll be on time. If we're not, you'll get $20 off your next bill. On-time guarantee entitles customer to a $20 bill credit for covered appointment misses. Available on all scheduled installation and repair appointments for video, Internet and phone services. Excludes appointments missed due to factors beyond Cox’s reasonable control, such as weather-related hazardous driving conditions, road closures or other abnormal traffic conditions. Limit one credit per missed appointment. 30-day money-back guarantee available on new service activations (not including service transfers) and is limited to refund of (i) Video: standard installation charge, first regular monthly programming charge, and first month’s Cox video equipment rental, and excludes charges for non-standard installation, sports packages, pay-per-view and On DEMAND programming, and other video-related charges; (ii) Internet: standard installation charge, first month’s service fee, and equipment charge if purchased or rented from Cox, and excludes other Cox Internet-related fees; and (iii) Phone: first month’s recurring service fee for the subscribed Phone plan on one line, and excludes installation, out-of-plan long distance and toll, and all other phone-related charges. Service for which refund is requested must be disconnected, and request for refund must be made, within 30 days of service activation. Other restrictions may apply.